A gurgling toilet is not a welcome sound. While there are a few possible causes, two of the most common are faulty tank equipment or a clog. The first cause, faulty tank equipment, can be diagnosed fairly easily. Before you throw out older pieces, first adjust the float level to ensure enough water is filling the tank. Generally, the water level should be about ½ inch below the overflow tube. If you require new parts, such as a flapper or valve, despair not—they are generally inexpensive. Clogs are often simple to fix… but not always. First, try a plunger. If you’re lucky, this tried-and-true tool will be enough to remove the blockage. If not, it’s possible that the vent is clogged. This might require a more in-depth clearing process, including putting a plumber’s snake through the toilet vent on top of your roof. We recommend calling a skilled plumbing specialist, such as Washington Energy Services, for a clog that requires this more invasive step. The toilet is either running or trickling. A running or trickling toilet isn’t just annoying—it can be a costly waste of water. If you see trickling water coming into the toilet bowl, the reason is usually a leaking toilet flapper. An alternate cause is the toilet flush valve. We recommend checking the toilet flapper and its components first, since it is the least expensive to replace. Inspect the chain and make sure it isn’t tangled or hung up, as this alone can cause the trickling water. If it is in order, purchase a new toilet flapper from the hardware store. If your toilet is constantly running, the toilet fill valve could be to blame. This device fills water into the tank and features a float device that causes the valve to shut off when the water gets to the correct level. The valve can be adjusted or replaced to keep the water at the proper height. Have you ever heard your toilet flush in the middle of the night? No, it’s not a ghost. (Probably.) Your toilet is phantom flushing. Luckily, the fix usually isn’t difficult and can often be remedied with a new toilet flapper. If you are experiencing any of these issues and simple fixes aren’t working, call Washington Energy Services. Whether it’s a running toilet you just can’t stop or a major water-leaking situation, our technicians have the knowledge and skill to get your toilet back to doing what it does best… we’ll leave it at that. Invest in new fixtures and hardware. Perhaps one of the least expensive upgrades you can make, new fixtures add shine and newness to any room. An older bathroom sink can instantly be brought into the 21st century with a new faucet, which can quickly and inexpensively be replaced by Washington Energy Services. The same goes for a leaky or outdated bath faucet. Updated hardware is also a quick and inexpensive way to upgrade your home. For example, doors with scratched brass doorknobs are given new life with modern brushed metal options. Changing or adding modern or classic cabinet hardware is also a way to upgrade the kitchen—an important and lucrative area when selling a home. Open the door to higher offers. The National Association of Realtors develops a report each year that compares remodeling cost versus value. This report rates home projects with the highest and lowest return on investment. Door replacement consistently ranks very high in terms of ROI. That’s because a front door—good or bad—makes a first impression. An old or damaged door screams cheap, while a new or well-maintained door says sophistication. Door options from Washington Energy Services can replace your outdated or worn-out door with a classic, traditional, or modern option. If a new door isn’t in the budget, invest in a high-gloss paint and give your door a pop of color. Make the move to vinyl windows. Many older homes still have single pane or aluminum-framed windows. If you have a few (or more) of these in your home, consider replacing them with vinyl windows. The presence of single pane or aluminum-framed windows are a deterrent that are noticed by potential buyers, because they are less energy efficient, collect condensation, and can be drafty. If a full window replacement isn’t an option for your home because of budget, pick a few of the more prominent or drafty windows to replace. Just because it’s a seller’s market doesn’t mean your home shouldn’t stand out. Most homes can benefit from a few quick upgrades, and your bottom line can as well. Check out your pipe insulation – Pipe insulation is one of your most effective means of defense against frozen pipes. Pipes should be wrapped in insulation of recent manufacture. It’s tough to check all of the necessary pipes yourself, as they may run through some hard to reach areas, so it’s worthwhile to have professional plumbers check insulation. Visually inspect your pipes – Taking a look at your pipes can be one of the quickest ways of identifying problems. If pipes show cracks or leaks, you’ll need to get a professional to repair or replace the faulty pipe. Again, finding pipes and identifying damage can be tricky, so it’s worthwhile to get a plumber to handle the work. Inspect your home for cracks – Cracks and holes along the outside walls of your home or in your foundation can allow cold air to reach your pipes. By inspecting your home for these flaws, you can take proactive steps to seal cracks and holes and better prepare your home for winter. Check for signs of frozen pipes – Identifying frozen pipes and correcting the situation can help prevent damage to your home. If you turn on your faucet and nothing comes out, it can be an indicator of frozen pipes. Also, if you’re hearing water running even when your faucet is turned off and no water is coming out of it, it’s likely that your pipes are leaking. If you have frozen pipes, a professional plumbing service can help safely thaw your pipes. Under no circumstances should you use a blowtorch to thaw a frozen pipe, as you may injure yourself or start a house fire. Common sense solutions – If you know a cold snap is coming, take proactive steps to avoid frozen pipes such as disconnecting water hoses, turning off and draining sprinkler systems and wrapping up exposed pipes. Water damage to other portions of your home is typically the most costly consequence of a burst pipe. It can be quite expensive if leakage or flooding goes on for an extended period of time. The average insurance claim for water damage resulting from frozen pipes is around $15,000, according to State Farm Insurance, so it’s well worth your while to invest a little time in inspecting your pipes and calling a plumber if necessary. When choosing a plumber, it’s important to pick one with an established track record of exceptional customer service and professional expertise. Washington Energy Services is a family-owned business providing heating and cooling services as well as professional plumbing services. Founded in 1957, Washington Energy Services has generations of experience in providing comprehensive plumbing solutions, including sales, installation and service. A member of the Puget Sound Energy Contractor Alliance Network, Washington Energy Services has an excellent local business reputation. Tank water heaters fail at the holidays? There’s nothing like the combination of extra use and cold outside temperatures to push an old standard tank beyond its limits. If your tank is limping through its 10th or 15th year of life, parts in it are likely to be worn and fragile. The cold temperatures outside (or in your basement) make the water in your plumbing colder. This causes your tank water heater to work a little harder and longer to get the water to your set heat. In addition, the differential between the hot water on the top of the tank and cold water coming in at the bottom is greater, causing extra flexing of the tank itself. And then you add extra use from Thanksgiving dishes, holiday guests and students who are home from college and it’s a meltdown waiting to happen. Our emergency water heater team is standing by 24/7 in case your water heater gives up, but you can be proactive about this in several ways. If you know your water heater is old but you don’t want to replace it, consider a leak detection and protection system. This will shut off the water and alert you if there is a leak, giving you peace of mind. Replace your old water heater proactively with a new tank water heater or a tankless. Give it some TLC with a flush of sediments and if needed an anode rod replacement to ensure it’s running the best it can. Make sure your temperature setting is 120 degrees or less. 120 degrees F is the standard temperature for water heaters. 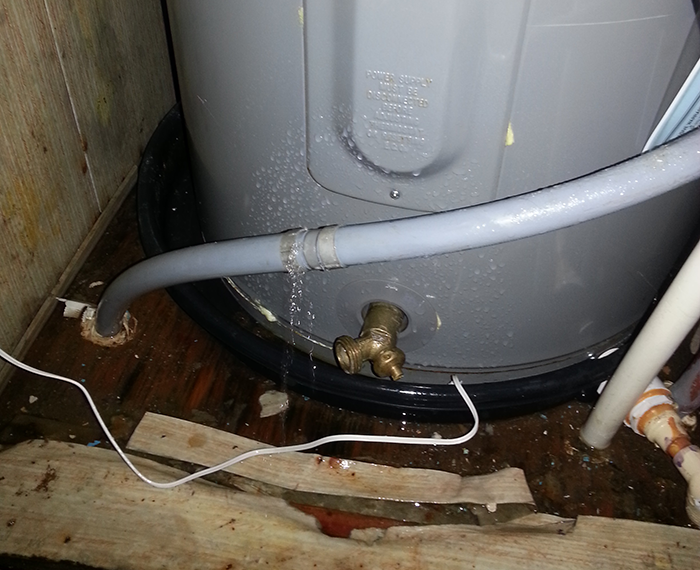 Sometimes people crank up the temp thinking that the water heater will produce more hot water. It won’t, it will produce the same amount of hot water, but it will be scalding hot. It also puts more wear and tear on the parts inside. The only way to get more quantity of hot water out of your tank is to make sure you have flushed out the sediment build up. It happened to one of us (the author of this article). Thanksgiving day, the guests were arriving and I made a mad dash to the basement to get something from the freezer. Oops , the main drain had backed up into the basement! Fortunately, our plumbers are available 24/7 and even on holidays. We had the drain cleaned quickly and sent the plumber home with a to-go plate of turkey dinner. Plumbing, and particularly mainline drains, backup around the holidays, not just because you are using more water and flushing more toilets but your entire neighborhood is doing it too! Add in some grease poured down the drain, dishwashers running and extra showers, plus if you live in a older residential neighborhood (like Ballard or Queen Anne,) possibly shared piping with another house, and it’s a recipe for overloading the plumbing. And then the water goes back where it came from, into your house. Hence the term “back-up”. Have a plumber come and snake your drain before your holiday rush. Preventative maintenance is the best way to avoid a disaster. Also, if you’re hosting, avoid using your garbage disposal. It may seem like an easy way to quickly dispose of greasy leftovers but the solids just sit out there in the drain and with all the extra plumbing system use, this compounds the risk of backup. Boiling water with our without a cup of liquid bleach can be used to clear sinks. The boiling water will break down solids and is better for your pipes than liquid drain cleaner. Some people try to use vinegar and hot water. For plumbing or water heater sales and service, call Washington Energy Services at 800-398-4663. Or you can call our plumbers directly at 800-590-4969.